Home Czech republic Visegrad nation states tell Brussels to “back off”. V4 Report: Visegrad nation states tell Brussels to “back off”. More precisely, after Saturday’s results in the Czech Republic, the people of Visegrad have made it clear where they stand. Meeting in Budapest, the leaders of Visegrad agreed on a joint stance on how to reform the EU following Britain’s departure next year. The four vibrant countries are pushing back as the older western EU bloc, led by Germany and France (and backed by the Eurocrats), designs initiatives to expand the power and scope of Brussels by developing proposals for more integration among the remaining EU states. “Europe needs a new blueprint. We must speak about an alliance of free nations,” said Hungarian Prime Minister Viktor Orbán. 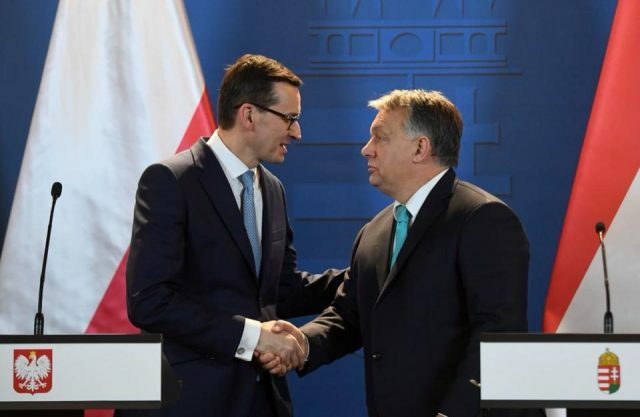 He was echoed by Polish counterpart Mateusz Morawiecki who said a “strong, integrated Europe” should be based on a group of sovereign, national member states rather than an increasingly centralised federation. Warsaw and Budapest have become the leaders of the mainstream rebellion, clashing with the leaders of Brussels over migration, sovereignty and federalism. Poland and Hungary promote Catholic, conservative values and often clash with the multicult theology of Brussels. Poland has drawn the sharpest criticism from Brussels since the conservative Law and Justice (PiS) party won the election in late 2015 and swiftly acted to reject the migrant quotas and to reform a corrupt judicial system tainted by lingering communist influence. All four Visegrad countries have repeatedly rebuffed demands from Brussels and western EU states to host some of the millions of overwhelming Muslim migrants who flooded the EU. Migration and the actions of Brussels and Berlin have divided and undermined trust in Europe. “EU institutions should treat all member states equally and act strictly within the remits of their respective competencies. The right of member states to carry out domestic reforms within their competences should be respected,” it said. The Battle for Europe has intensified as the leaders of Visegrad and Central Europe prepare to “push-back”.